Following the chaotic day at school, it was time to take Megan and Nate to one of my favorite places in Korea: Busan! We left Jeomchon right after I finished school on Friday and began the somewhat long journey to the country's south. We arrived tired and hungry, and began our search for some western food. Sorry Megan and Nate, but when you take the country kids to the city, we can't help but get our western food fix! After finally getting some delicious food we began our search for a motel. We were staying by Haeundae Beach, which we assumed would have more motel options than it actually did. We finally gave into our exhaustion when we found a place with a cheap price and made the unfortunate mistake of accepting the room before taking a look at it first. The result was a room that was in pretty terrible condition, which can best be illustrated by the fact that there was a cinder block in the toilet. 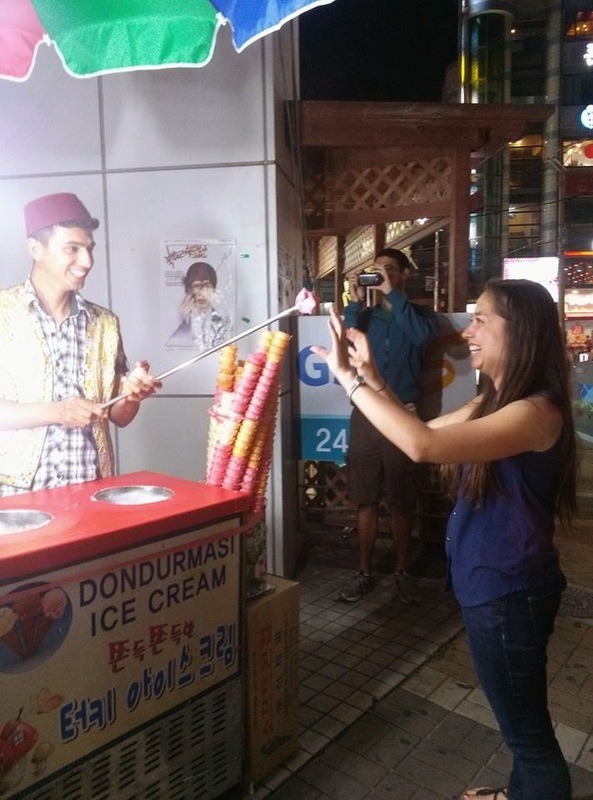 Sorry again Megan and Nate, I swear that I've been to plenty of motels in Korea, but this one was definitely a first! Despite the room's less than desirable condition, I think we all slept pretty well given the circumstances. When we awoke the next morning, we got ready to make our way to one of Busan's most famous temples, Haedong Yonggungsa Temple. This temple is right on Busan's coast, and has stunning views all around. Out of all the temples I've been to in Korea (which is quite a few by this point), this one was by far the most beautiful I've seen thus far. 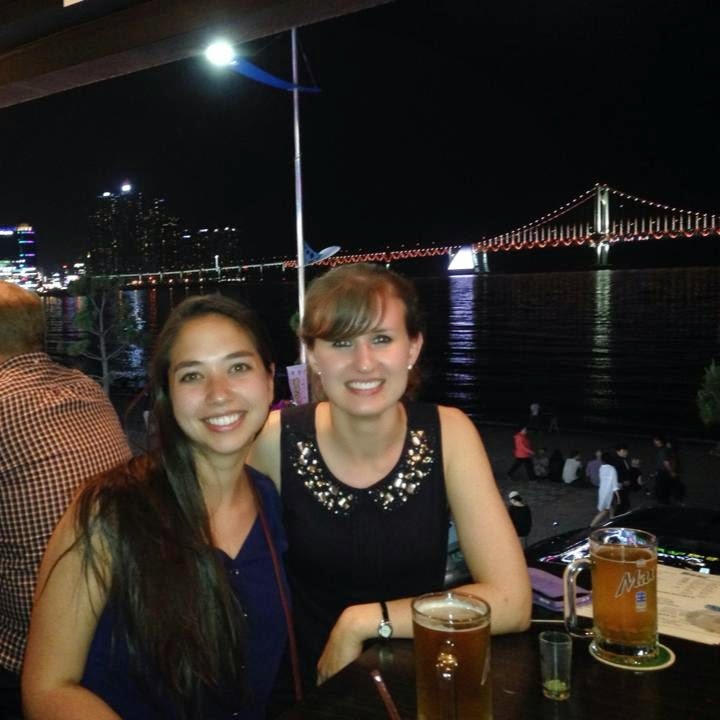 From West High to Korea...who would have thought? Friends from home meet friends from Korea. I love having my worlds collide! After soaking up the beautiful views of the temple, we went back to our room and got ready to hit the beach. It was an absolutely beautiful day, so there was no better place to be than on Haeundae soaking up the sun. After all, no vacation for Megan and me would be complete without some beach time. As evening approached, we changed and got ready for dinner. 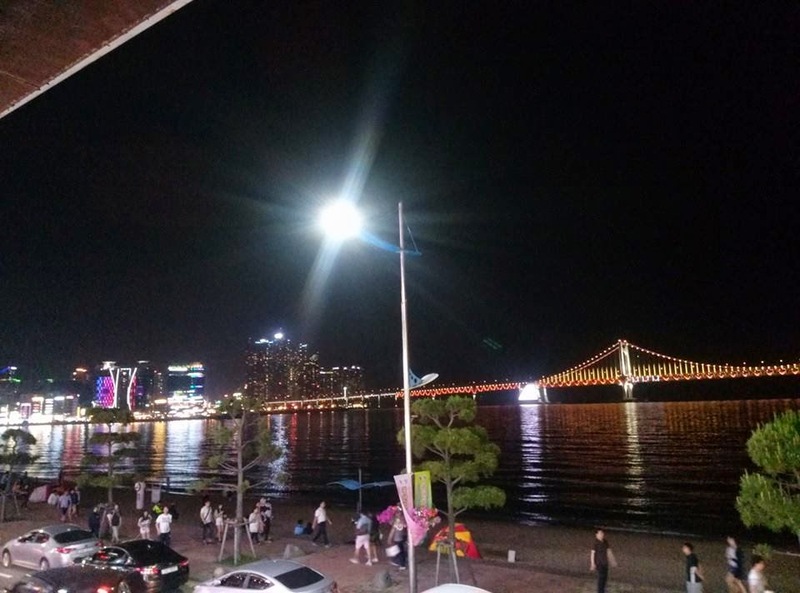 We headed over to Gwangalli Beach, where we had a beautiful beach view for dinner. We got to watch the sun set, and see the bridge light up as the sky became dark. After hanging out with the wonderful view of Gwangalli right in our sight, we caught the last subway back to Haeundae, where we naturally chose to end our night with noraebang. Not a bad view to have while grabbing a few drinks! After singing all of the classics (and then some), it was time to hit the hay. Sunday we made the journey back to Jeomchon, and Megan and Nate hit their one week anniversary in Korea. Halfway through their visit, there was still lots of fun to come! Coming back for another year!